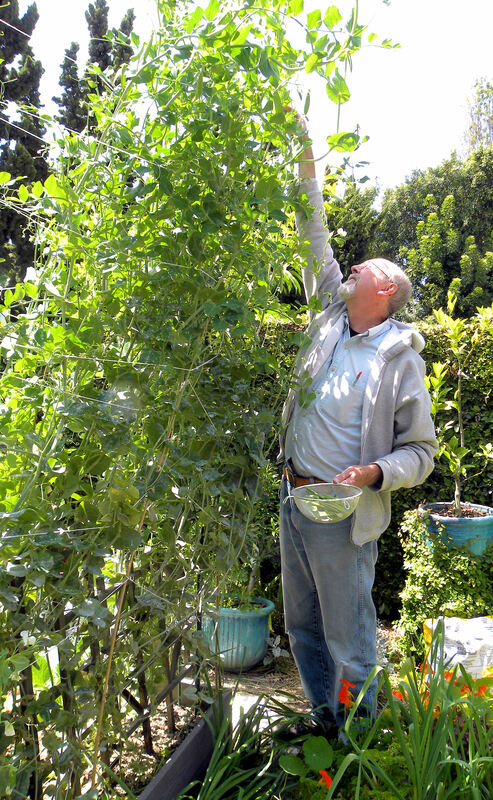 Posted on April 20, 2010	by Lou Murray, Ph.D.
Our Super Sugar Snap pea vines have topped nine feet. I can no longer harvest the peas and have to depend on my 6 ft tall husband to pick them. Well, that photo of Vic picking peas should say it all, but I am not a woman of few words. I want to add that I’m enjoying my garden this year more than I’ve ever enjoyed any garden season in the past. In part this is due to the fact that this really is my best garden ever. Being semi-retired is giving me time to work on it and I think that the results are apparent. 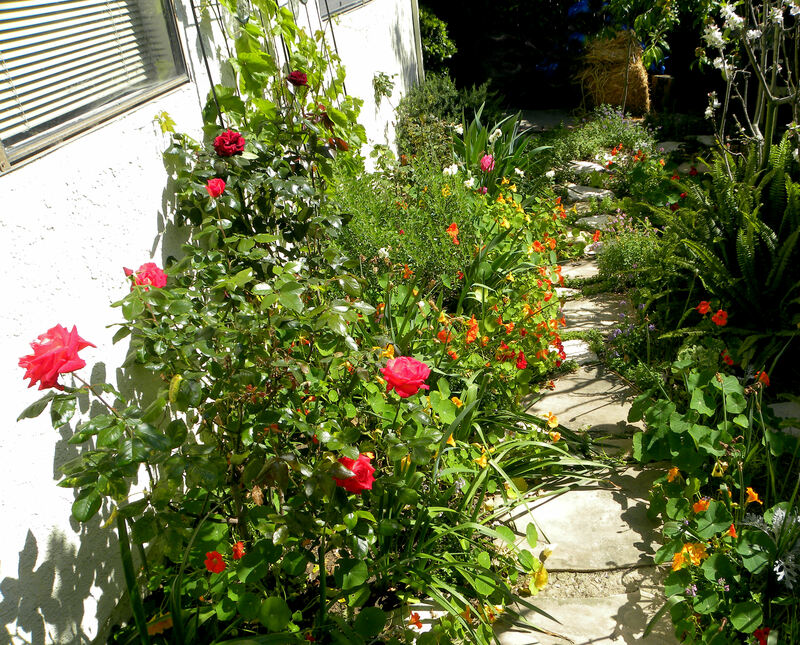 Pathway in back of house bordered by roses, grapes, narcissus, allysum, pansies, nasturtiums, Nemesia and fruit trees. But the largest part of my enjoyment is due to the network of fellow gardener/blogger/photographers that I’ve found over the internet. 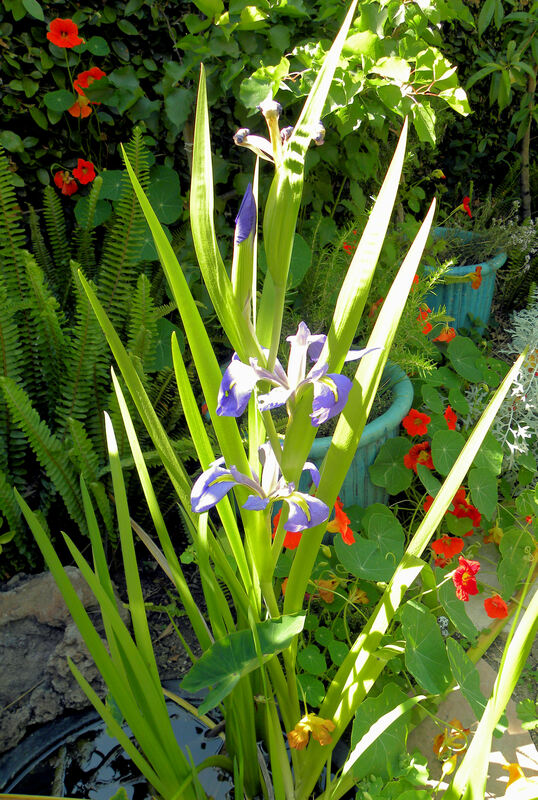 Being able to share my garden with others and see the gardens of people who share my interests has added immensely to my enjoyment. 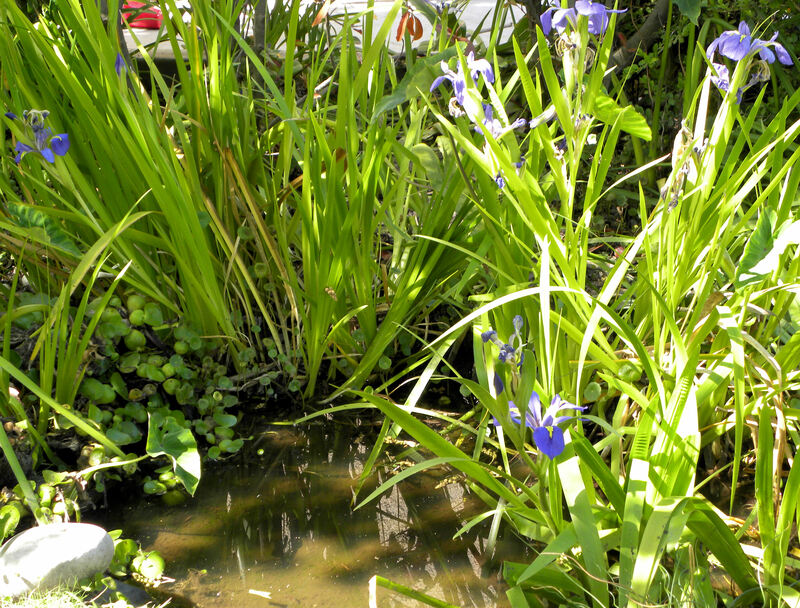 Irises are blooming in my larger front yard pond as well. 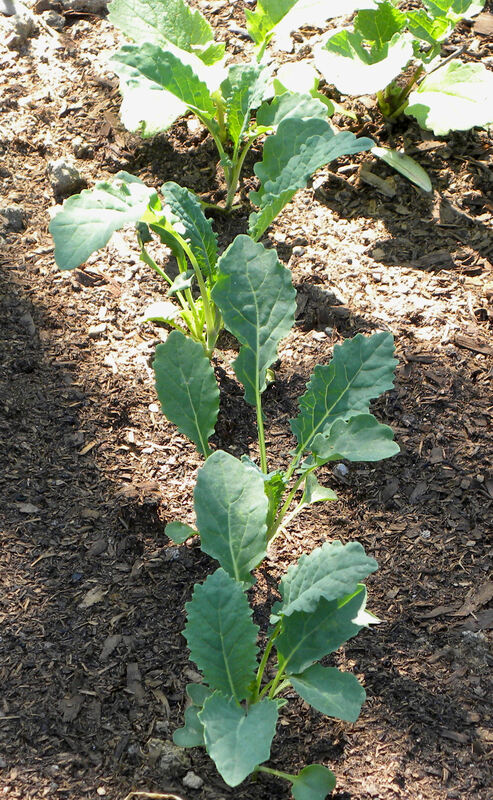 One of the many advantages of having a garden is that you can grow varieties that may not be available at stores or even local farmer’s markets. 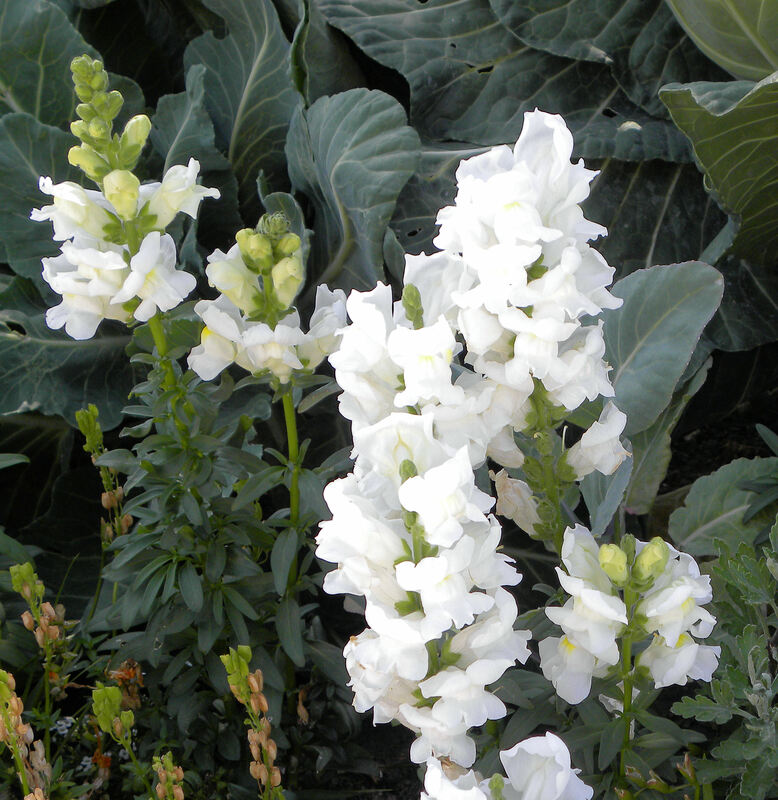 I’m trying quite a few new vegetables this year, and new varieties of favorite vegetables. I’m also enjoying the challenge of growing food in a limited space. I am even utilizing the driveway this year. 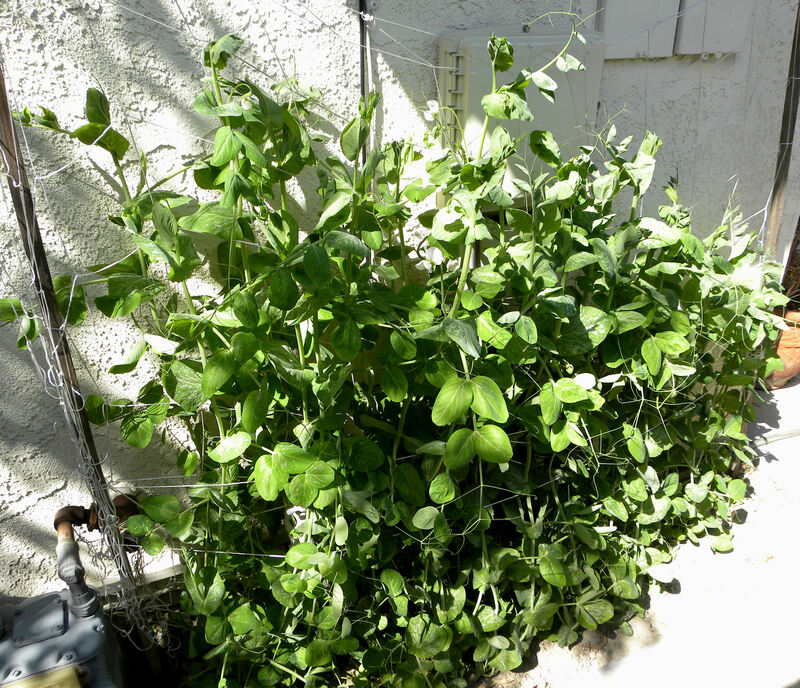 Mammoth snow peas are growing in a tiny dirt strip next to our water and electric meters. 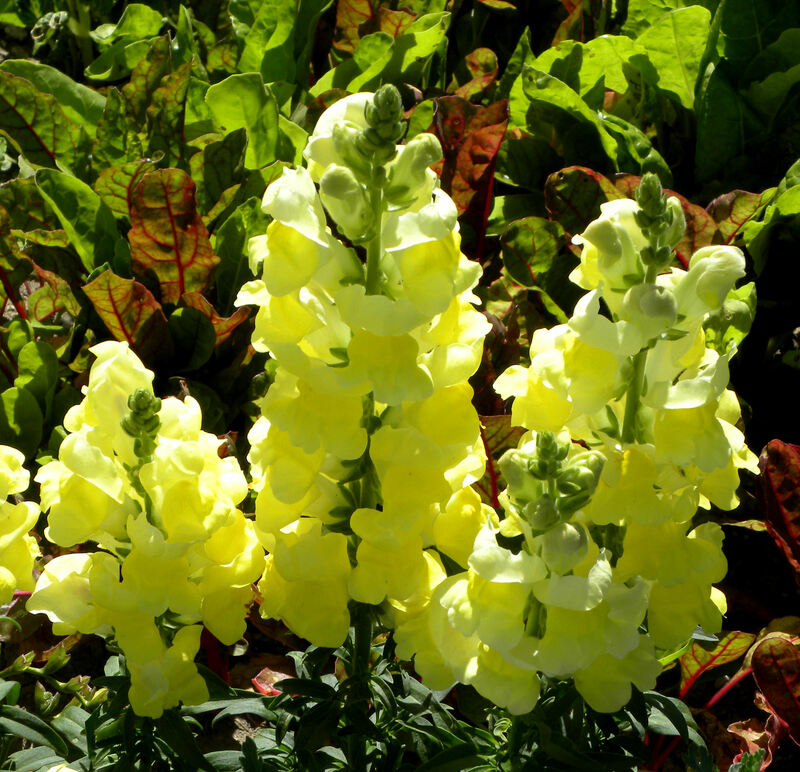 I haven't grown this variety in over 30 years and am looking forward to having them again. Also, I’m learning a lot from reading the blogs of others. I enjoy learning more about preserving and cooking from Thomas, Dan, Mac, and Villager. From Daphne at Daphne’s Dandelions, I’ve learned a lot about record-keeping. I had never weighed and tracked my harvests before. I’ve set up a seed inventory in Excel as well as a fruit harvest Excel spread sheet. Now I actually know how many pounds of fruit I’ve harvested so far this year (14 lbs) and from which trees/vines/bushes/plants they came from. 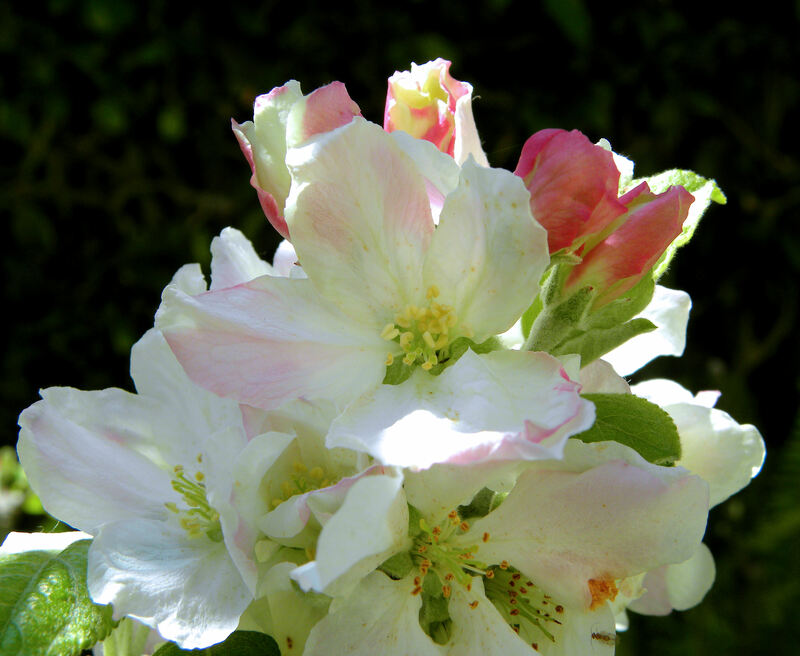 Semi-dwarf Granny Smith apple tree is in full bloom, promising a good crop of apples this year. 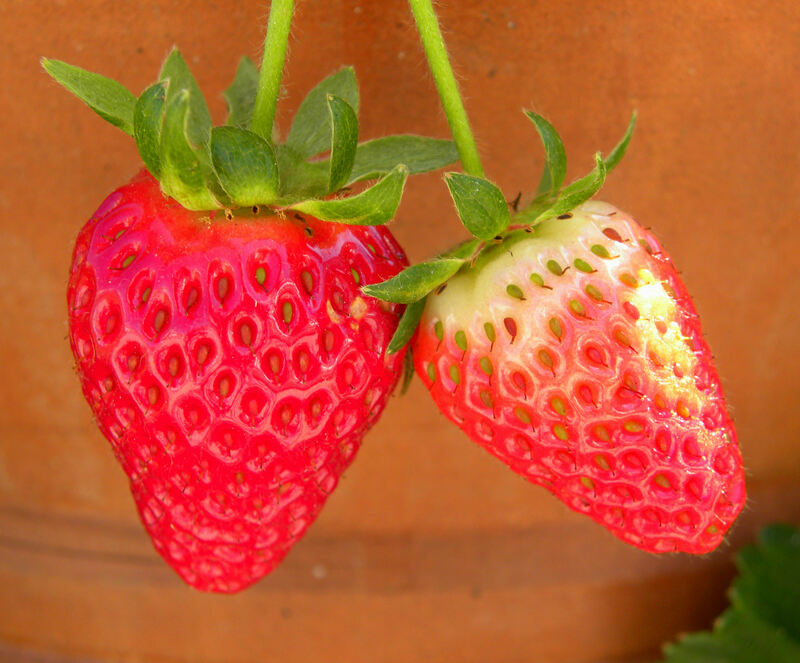 Our strawberry harvest is only a few berries at a time from the strawberry pot, but the berries are delicious. My next step will be to set up a similar spread sheet for vegetables. Then I hope to keep a running tab on my sidebar of the year’s total harvest, as you see when you visit Dan, Thomas, Annie’s Granny, Daphne and other bloggers. What I do not plan to do is track how much I spend on my garden. I don’t want to know. Suffice it to say that I’m having fun and enjoying life. But what cannot be quantified is how much pleasure I’m deriving from growing so much of our own organic produce, including having chickens that lay eggs, and having so much beauty in the yard this year. 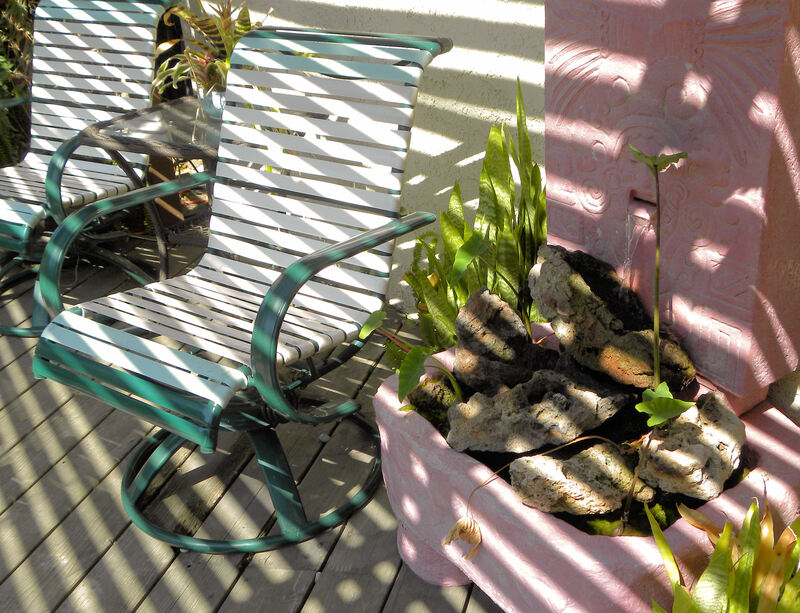 This is the rocking chair on my back deck. The fountain burbles, the hens cluck, and birds sing while I rock, read, sip wine, and watch my garden grow. If you had a harvest this week, visit Daphne at Daphne’s Dandelions and tell about it. 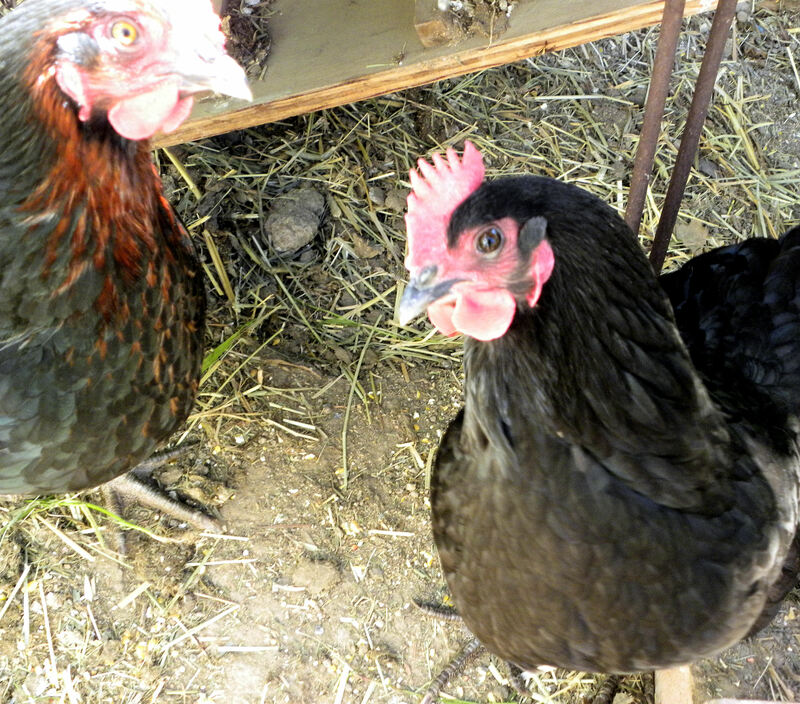 This entry was posted in Uncategorized and tagged backyard chickens, flowers, Fruit, Harvest Monday, photos, vegetable garden, water garden. Bookmark the permalink. Your garden is so lovely! Southern California looks really good to me right now, after an April snow on Saturday in Maine. Those strawberries….mmmmm! Everything looks bee-utiful!. I love the way you’ve combined the veggies and flowers together. The colors so pretty! Lou, that is a great life. I really don’t think there is anything else to be said. Hi Turling, Ali, Sharon, and Clare, thanks for stopping by. Ali, don’t be too jealous of our great weather. We just had an earthquake about 10 minutes ago. It was only 2.7, but the epicenter was only a few miles from us. No damage, just rattling. Definitely Lou, a great life. And as you say, its value is not quantifiable. Those peas sure are nice! When my plants are that tall I just let them fold over the trellis. I do not have a 6 foot pea picker around! Angela, I hear you about letting the peas flop. They’ve outgrown my pea-picker too. I’ll be darned if I erect an Empire State Building sized trellis just to support my peas. I keep thinking that they’ll stop sooner or later, but they just keep on growing. I’m loving it. At least something is growing. The funny thing is that I started record keeping publicly because I was so bad at it. I hated not having records. I wanted to know when I planted things the year before. I wanted to know if I got a better harvest if I did something one way instead of another. I love to experiment, but to make it more meaningful you need to record. I really like having my records now. I started keeping track of how much I spent, not because I cared, but because I was curious. The seed companies were shouting that for $25 you can grow over a thousand dollars worth of food. I wasn’t even sure if I broke even or not. I knew I spent several hundred dollars each year on the garden. Of course I only counted the vegetable and fruit gardens, not the ornamental areas. I was surprised by how much my vegetable garden made. Daphne, I love your records. They have inspired me to do better. I think it must be the MIT scientist in you that drives you to keep such good records. Given my research background, I’m surprised that garden record-keeping didn’t come naturally to me. I like the research question of “how much did I grown and how much did it cost me.” But not enough to keep track of my costs. It’s not very cost effective the way I do it (chicken coop $800, raised beds $600 plus the cost of compost and manure, etc. ), but I’m having a good time. 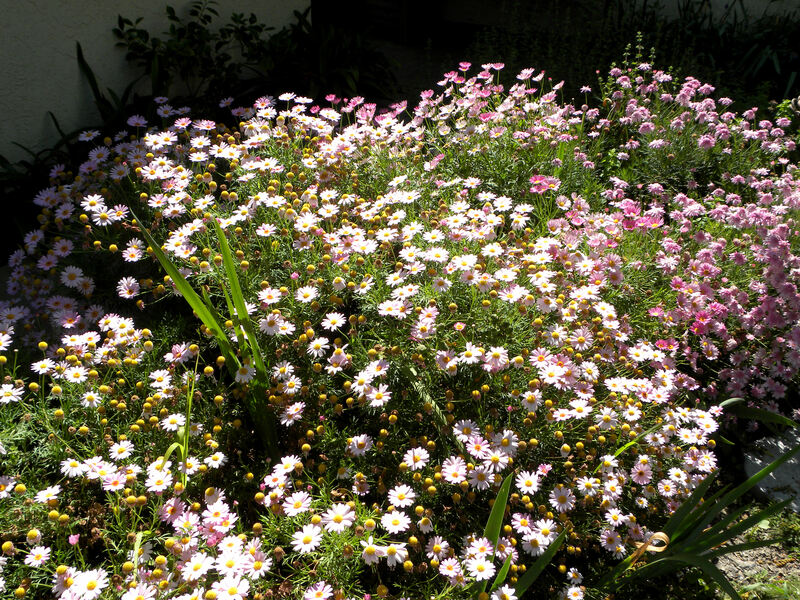 Your gardens are lovely, even the driveway – and that’s a lot to say for an expanse of concrete! Many years ago I used Lotus to set up a double file – one is a planting guide for our are, based on the reccomendations of the Sunset gardening guide. The other is just a listing of the seeds I have and how long they are viable. Have you ever made your own seed tapes? 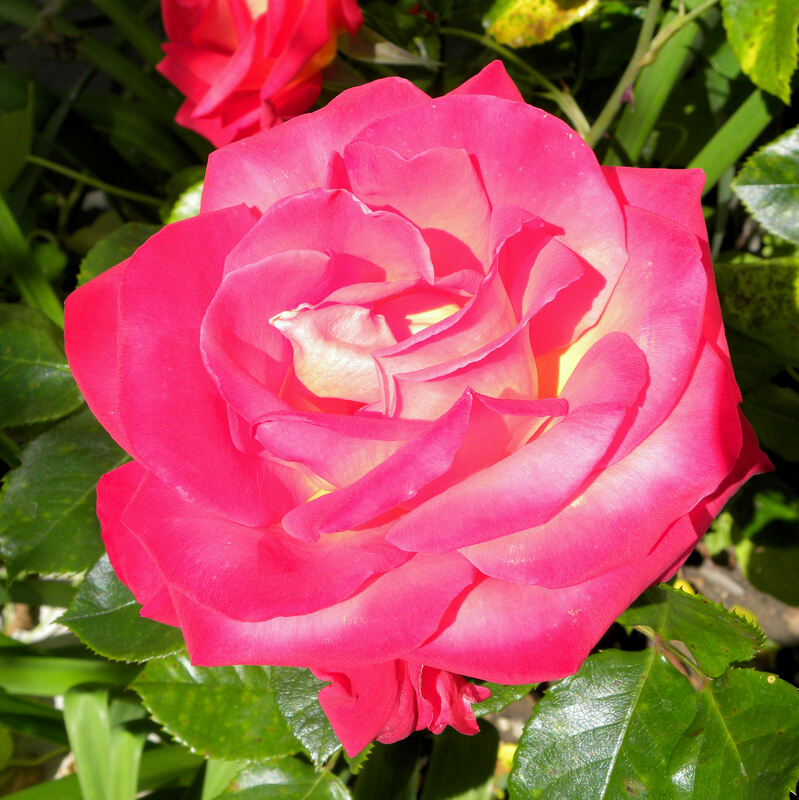 We have an 8 year old gardening grandchild, and those are easier for him to handle…. No, Kathy, I’ve never tried seed tapes. The closest I’ve come to that is last week I laid down a row of toilet paper, sprinkled some carrot seeds on it, covered it with another layer of toilet paper, and covered that with a thin layer of soil. That’s supposed to keep the seeds from washing away and also helps me see how many I’ve sprinkled. First time I’ve tried that technique, so I hope it works. A nice spot to sit and admire you work is a very important part of the garden. 🙂 The problem for me is that I always see something that needs my attention and I just have to get up and do something about it . . . 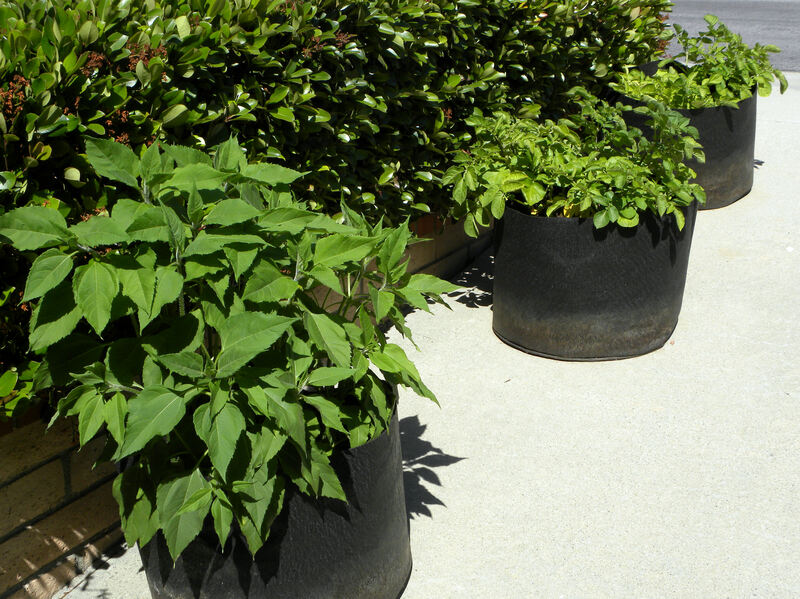 Your potatoes seem to like their pots, I was tempted to try those smart pots, 15 gallon black plastic ones didn’t work all that well for me. This year I’ve decided to use my old stacking compost bin. Michelle, that’s what the glass of wine is for. It keeps you from hopping up and working. Another earthquake, that’s a close one! I miss CA but not the quakes and traffic. Your garden is lovely, I like the variety of things you grow, it’s wonderful to pick fruits, veggies, and eggs from your own garden. I’m jumping on the potato band wagon and try to grow in those 15 gal smart pot, you and Jane make it look so easy, I was inspired and want to try it also. Well, Mac, it was easy planting the potatoes in the Smart Pots. I have yet to see if they make any potatoes. It’s a fun experiment, trying to grow food in my driveway.